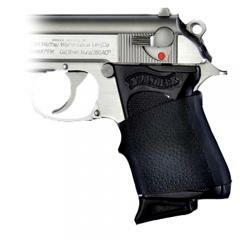 The Hogue HandALL Jr is a universal grip sleeve designed to fit a huge variety of .22, .25 and .380 small-framed semi-automatic handguns as well as pistol grip rifles like the AR-15. Its contoured shape is made to provide the closest possible fit, without air pockets or loose patches that would compromise its effectiveness. The rubber material is strongly textured, providing a secure gripping surface that won't slip in your hand and throw off your aim. On the front side, a single finger guard enhances stability and control for improved retention and accuracy.